In the last 15 years his career has left an indelible mark on the silver screens. Through his collaborations with Steven Soderbergh, M. Night Shyamalan, Gary Ross and Francis Lawrence, production designer Philip Messina has worked, among the rest, on “Erin Brockovich”, “Traffic”, “Solaris”, all three “Ocean’s”, “8 Mile”, “The Last Airbender” and the upcoming “Free State of Jones”. And it has unquestionably been almost impossible to escape the juggernaut of “The Hunger Games” franchise, with Philip working on all four films in as many years. In this interview he talks about the world of big-budget productions, returning to work with the same director on multiple projects, various aspects of physical sets and digital / CG environments, and designing movies that are watched on a variety of screens in our daily lives. In the second part of the interview Philip delves deeper into the intricately built worlds of “The Hunger Games”, talking about the schedule pressures of designing and shooting the two back-to-back parts of “Mockingjay”, approaching an existing universe from the book trilogy and translating it into on-screen visuals, defining the totalitarian spaces of the Capitol and finding parallels in the world of technology between the imaginary world of the franchise and the world that we all live in. Stills from Avenue of Tributes sequence in “Catching Fire”. Philip: My name is Philip Messina and I’m a production designer. I got into the industry in 1990 as a set designer, which was really a draughtsman, working with Stuart Wurtzel who was the production designer on the film “Mermaids”. I had never worked in the film industry before or even knew that these jobs existed. They came to Boston to make this movie, and I worked on it for a few months and instantly fell in love with the film business and specifically the art department. I drew little bungalows and designed a lot of signs from the ’50s and the ’60s. That was back in the day where people didn’t really know what Hollywood did. There were no DVD extras or that kind of stuff, and I had no idea that there was a film business that took what I loved about architecture and design, and transformed it into films, which I also loved. It was a very transformative experience for me. I then was lucky enough to work on several films based in the Boston area after that. I was uncredited on “School Ties” which featured Matt Damon and Ben Affleck when they were local actors. I also worked on “House Sitter” where we ironically got to build a dream house for an architect. Then I saw very quickly that if I wanted to move up in the business, being in Boston was probably not the best place to be, that it would probably go faster if I moved to LA or NY. My wife and I got married and we both restarted our careers in Los Angeles, and I worked my way up from set designer to art director through the ’90s. In 1999 I was fortunate enough to design “Erin Brockovich”, and then right after that “Traffic”. I had previously art-directed “Out of Sight” for Steven Soderbergh, and he gave me my break on “Erin”. It was crazy start to my career as a designer – both “Erin” and “Traffic” were Oscar nominated for best picture in 2000. That started an almost 10-year collaboration where Steven and I made all three “Ocean’s” movies, “Solaris” and “The Good German”. It was a very fun time. 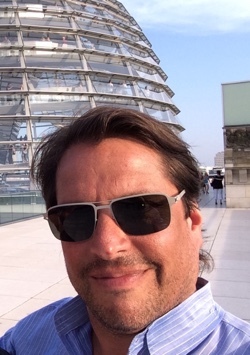 “The Good German” was in black-and-white set in post-war Berlin, “Solaris” was a ver heady science-fiction film, the “Ocean’s” movies were huge builds and we got to shoot all over Europe for “12”. It was quite an adventure, and my wife Kristen was the set decorator through all those films, and we got to travel and work together. Those were some of my favorite years in the film business. So that gets us up to the present day where I’m in Montreal working with Darren Aronofsky on his next film which stars Jennifer Lawrence and Javier Bardem – we start shooting in about 7 weeks. Top: concept illustration for Katniss airlift sequence by Nathan Schroeder, courtesy of Philip Messina. Bottom – stills of the sequence from “Catching Fire”. Kirill: As you collaborate with the same people, director or cinematographer, on multiple productions, does it become easier as you can anticipate what each side expects from the other? Philip: Sure, it becomes easier. You know people’s strengths and weaknesses, and that goes both directions. He knows mine and I know his, and you are able to complement each other more easily. I worked with Francis Lawrence on three movies, with Gary Ross on two, with M. Night Shyamalan on two, with Steven Soderbergh on nine or ten. I tend to want to cultivate relationships with directors that I find interesting on projects that appeal to me. As I’ve worked through my career, I find that there are different things that appeal to me at different times in my life. I’ve done period movies, I’ve done a couple of science-fiction movies, I’ve done fantasy, and this movie that I’m working on now is sort of undefinable. It’s unlike anything I’ve ever done, and if you know Darren Aronofsky, he has a very unique voice as a director. This is very exciting. It’s really about working with creative people that I find exciting, whether it’s a cinematographer or a director – hopefully it’s all of the above. When it all comes together on one film it’s kind of magical. That’s what you’re always hoping for – a chemistry that all of us are able to put our best work forward and have it add up to something that is greater than the sum of its parts. Kirill: It’s great when everything clicks together. Philip: And at the beginning you don’t know but there’s always hope. It’s always a new start and you don’t know what it’s going to be – it’s just words on a page that are open to a myriad of interpretations. Sometimes it’s a great script that becomes better, and sometimes it’s a great script that doesn’t turn out as well, and sometimes it’s an OK script that turns out really well [laughs]. There’s no formula to it. It’s very interesting. We’re all making a piece of art together. We’re all artists creating, and if the creation sort of gels, it’s magical. 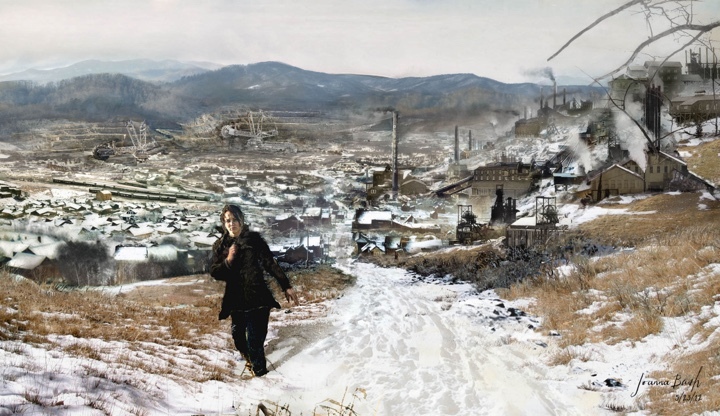 Top: concept illustration for Victory Village in District 12 by Joanna Bush, courtesy of Philip Messina. Bottom – still from “Catching Fire”. 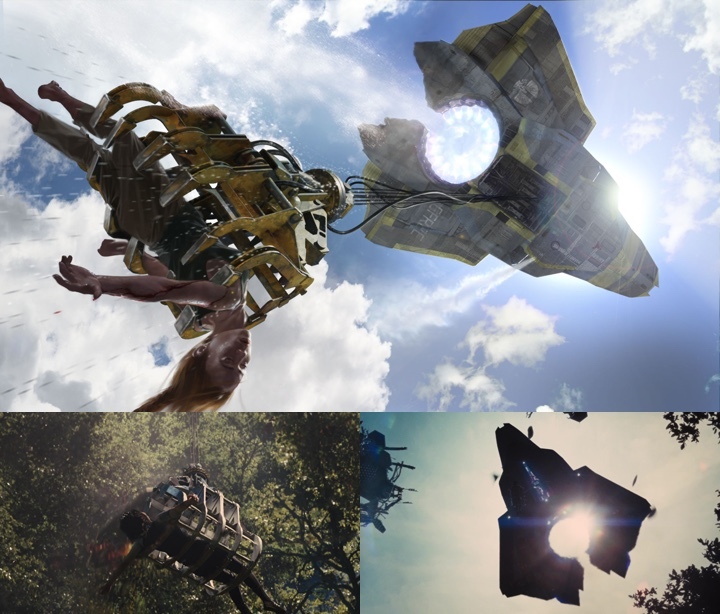 Kirill: Looking back at the last 20-25 years, do you see any big changes that have affected the art department and you as a production designer, as the industry has transitioned to shooting digital, and visual effects replaced the physicality of special effects? Philip: Digital is everywhere, even in movies that you would not expect them to be. They’ve really embedded themselves into the DNA of filmmaking at this point. I love working with digital effects artists. If there’s a good relationship where everyone’s on the same page aesthetically, it allows us to paint with a broader brush. I can create more and build less. I can get more out of my budget and I can build a better world in which to tell the story. Having said that, I’m mindful not to get seduced by the technology for technology’s sake. I feel like CG world can take over in a film very quickly, and I think that many of the filmmakers I’ve worked with have tried to use visual effects to tell the story and not get caught up in the spectacle of it. Honestly a lot of directors I’ve worked with lately have tried to achieve more and more in camera – not as a backlash but as a sort of a counterpoint to the rampant visual effects in films these days. That’s exciting, because you don’t ever want to shun CG to make your life harder, but you don’t want to use visual effects to be lazy about the craft. Concept illustration for the Seam area in District 12 by Joanna Bush, courtesy of Philip Messina. It’s very easy to say that we’ll put up a green screen to solve a problem and take care of it later. It’s a way of deferring decisions that if you have to make them in the moment, it may actually make the film better. It’s an interesting dichotomy. Films have certainly not gotten any easier because of computer and computer-aided imagery, and I’m not sure that you could argue that they’ve gotten better. What it really comes down for me is the craft of storytelling. Some of my favorite films were done with very few visual effects. Harper Lee just died recently, and I just re-watched “To Kill a Mockingbird”. I was driven to tears; it’s an amazing movie and obviously there’s not one visual effect in it. To me the challenge is to use visual effects to further the storytelling, and I’m not sure how many people have figured that out yet. As long as there are superheroes flying around, visual effects are going to be used for spectacle by many filmmakers at this point. Kirill: Do you think it’s also important for the actors to be surrounded by the physicality of a set instead of green surfaces? Philip: I do – it’s sort of unquantifiable the effect a real environment has on a performance – but clearly as a designer I’m not the most subjective voice out there. I love the look on an actor’s face, or a director and crew for that matter, when they walk onto a set that I’ve created and they see the story that I’m trying to tell. You’re telling a story with walls and paint and furniture. What we do is very abstract in a way, and the same thing with costume designers and cinematographers who use movements and light. The tools that I have are wood and metal and furniture and wallpaper and paint and color. It’s very gratifying and you feel that you’ve actually done something and completed something when the crew walks onto the set and they see the story that I’ve been trying to tell through my work. It’s not the same when they walk onto a set and they see a green screen, even if I have all the illustrations and concept art on hand, which describes what it’s ultimately going to look like. I often feel as though I’m in-between generations. I just turned 50 last year, and I remember the craft when we didn’t use a lot of visual effects in the early ’90s. To tell you the truth, I have a love-and-hate relationship with it. I try to use it as honestly as possible for the storytelling, and I hope that the filmmakers I work with do the same. Concept illustration for mining-scape set by Nathan Schroeder, courtesy of Philip Messina. Kirill: It also doesn’t seem that full-digital environments are that much faster to do at the quality level that we expect these days, or even that much less expensive. Philip: As far as the expenses, it really depends on what you’re doing and what you’re creating. I’ve built sets that are just doorways, and the entire set around it was created digitally. 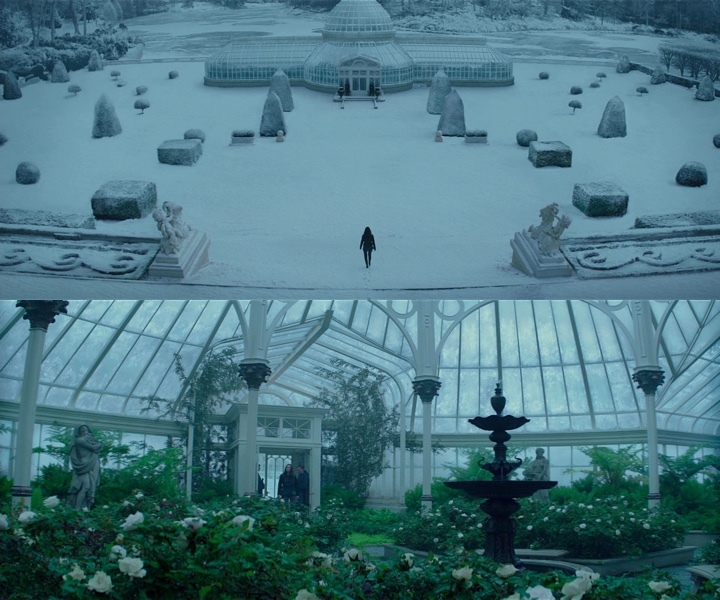 On “Mockingjay 2” there’s a pivotal scene that takes place in a greenhouse, in the story it is supposed to be located at this chateau that we shot as the presidential palace outside of Paris. I got to design a huge greenhouse, and we actually built the interior of it on stage in Atlanta. On location in Paris all we needed to build was literally a doorway. And in the film you can’t really tell that the exterior is almost entirely virtual. It’s rendered wonderfully and thank God that we had Charles Gibson as our Visual Effects Supervisor. Both he and Janek Sirrs (from “Catching Fire”) are true artists. I can’t help be wonder what we would have done if we didn’t have those tools? We might have shot on a piece of property that had a real greenhouse [laughs] – there are always creative ways around any problem. It’s just how clever you want to be. Stills from the greenhouse sequence in “Mockingjay: Part 2”. Kirill: How do you make a decision that a set is going to be physically built or shot on green screen and created in post-production? Is it about budget, or time and difficulty? Philip: There’s budget, time, and also the shot count. You amortize set costs and visual effects costs over the amount and complexity of shots as well as the environment. It is also about the difficulty. If you’re in a spaceship or something that is more obvious that makes sense, or if you’re in a fantasy city that doesn’t exist. On “Free State of Jones” which is a Civil War film, I modified an existing street in Louisiana and turned it into 1860’s. There were things like power lines that were so prohibitively expensive to take down. We would have to reroute the power of this whole small town to be period correct to Mississippi in the 1860’s. They didn’t have electricity or telephones – maybe they just had one telegraph line. So you decide whether to spend the expense to take the power lines down, or you erase them. Erasing is much more gratifying way [laughs] to spend money on visual effects for me. But there are also things like being able to put texture on roofs that were modern, I gave the CG artists samples and textures of period roof structures, so they were able to put those on top of roofs we weren’t able to do physically. It’s a great tool to be able to use. The difference is when you build a set or even go to a location, there are little happy accidents. And I always say that there are no happy accidents in visual effects world; you have to create them. It just depends on how well you create all the myriad of happy accidents that go into an image that we see. And if it’s done well, you can’t tell the difference. Concept illustration for Avenue of Tributes by Nathan Schroeder, courtesy of Philip Messina. Kirill: I’m imagining that a lot of people are driven to the industry because of the glamour. What do you think makes people stay? There’s a lot of pressure, and crazy hours and not not much in a way of predictable stable income. Philip: We often liken ourselves to the circus coming into town. You’ll find circus performers and film people probably have a lot in common. There are a couple of things I specifically love about what I do. I have a couple of good friends who are architects in Southern California – I joke that I have built more structures and more environments than they will ever have built in their lifetime, just because of the timeframe that they have to work with. And I get to design a greater variety of structures than they will have ever built – period houses, spaceships, post WW2 Germany, dystopian futures. I have friends that have spent 5 or 6 years trying to get a restaurant built! We also often say in the film business that if we had to go to the same office everyday nine-to-five and see the same people we’d be miserable. Every time you start a new film, it’s a fresh beginning. And with that beginning there’s an end. There’s an end where you all say goodbye to each other. Some people you’re going to miss terribly, and some people you’re happy to say goodbye to. There’s a beginning and an end to it that’s very finite. And then you’re off and you start another project. It could be years before you run into the same person that you’ve worked with in a camera department on some movie five years ago. You run into them and you can reminisce. In retrospect everything seems like the good old days. I think there’s an energy to it that’s somewhat addictive. But what has gotten more difficult lately, and I’ve been a victim of it, is that movies that are not predominantly made in Southern California anymore. I grew up in Boston, I moved from Boston to LA in 1991, and I thought that that was going to be the big move I would make in my life to be in the film business. And I was mistaken. Now I spend months and months in places like Atlanta or New Orleans or Montreal. It ends up being difficult to have a career and a family. In the past you could’ve easily raised a family and have a semblance of a “normal” life. Now it’s very much like you’re signing up for a life on the road, which I would expect makes it less desirable for a lot of people. 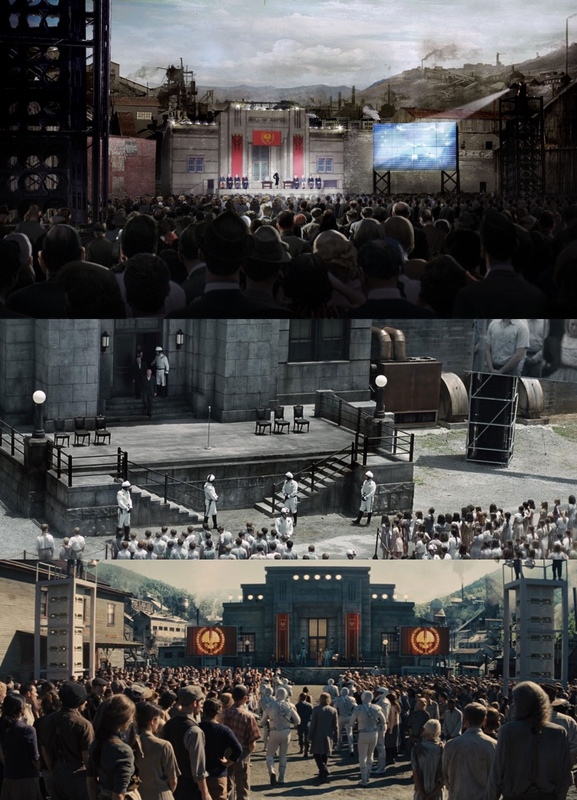 Stills of establishing shots of the Capitol in “The Hunger Games”. Kirill: So what stays with you after a production are only good moments. Philip: Yes. Isn’t that life? Everything that you complain about when you’re making a movie are your most nostalgic memories. The highs and lows are what you remember. It’s the middle parts that I tend to forget. Kirill: I think it’s the same for movies themselves. You remember the really good ones and the really bad ones, and the mediocre are gone. Philip: The ones that are OK – who cares? It’s very true. Every once in a while I like to watch a spectacularly bad film, just to think “Thank God that I didn’t work on it”. Also, no one sets out to make a bad film. Everybody sets out to make a great film. I’ve never worked on a project where the expectations were mediocre. You’re trying to tell a story, and you’re trying to make an impact on the audience. It’s like art. There’s good art and bad art, and art that you don’t care so much about and no one talks about it. Still from the train in “Catching Fire”. Kirill: You’ve worked on a lot of big-budget productions. Even at that level, is there such a thing as having enough money. Philip: Never. The problems get bigger. The chance to go over budget gets greater because you’re spending more money per day. The budget problems absolutely do not go away. They’re just at a larger scale, and in some ways it’s much more stressful. You often have a lot more moving parts. On a smaller-budget film the problems are often simpler. On bigger franchise films there’s so many departments involved. And the problems are fun to figure out too. It’s two sides of the same coin. I don’t know anybody that’s ever worked in a film who said “Oh, I had enough money to do everything”. You’re always making compromises, you’re always making cuts, and it’s very satisfying when you see the film and you see all the decisions that were made. And you don’t miss the things that were cut, or the compromises that you made don’t really seem like compromises when the film is done. That’s what you hope to achieve in the end. Kirill: Looking at the size of the art department on the four “Hunger Games” movies, that’s a lot of people. Would you say that on a production of this scale you’re part-time designer, part-time people manager and part-time budget wrangler? Philip: It’s very easy to get caught up in that. I make a concerted effort to design a majority of sets myself – with collaborators in my department – down to the details. I will never choose the administrative part over the art. I’m here to do the art, so I try to squeeze in as much as possible. Sometimes that means working on weekends, and being the first person in the office and the last person to leave. You do that if you want to create, and I’m always willing to do that if I get to create art. Still from the President’s party sequence in “Catching Fire”. Kirill: Did you know when you joined the first movie that you’d end up doing all four? Philip: Not at all. The one thing I remember distinctly from the first one is a lot of conversations about the fact that children were killing children. All of us read all three books right away just to see where the full story and the character arc went, and we all knew, making the first film, that it moved into bigger themes of war and social inequality. There was a lot to play with later on if we could just get through the first one, and people would buy that you’re killing an 11-year old little girl with a spear through her chest. I think that Gary Ross was the perfect person to direct that first movie. He has impeccable taste, and he wasn’t out to make violence a spectacle – in fact quite the opposite was true. It was about telling a human story, and to his credit it was a great success, obviously. Very early after that we knew that we were going to make the second one. And 2/3/4 are sort of a blur [laughs] at that point. They came out one after the other. We shot 3 and 4 back-to-back, so we shot two fairly big movies as one extremely large on in 156 days of shooting with no break in between. That was in Atlanta, Paris and Berlin. Not only it was a huge shoot, but it was also logistically very challenging. At one point I had three art departments on two continents working simultaneously. With the time change I felt like I was either always on stage with my current art department or on the phone with my two future art departments. That was a marathon, and I particularly wanted to do that because it’s a club (for whoever is keeping score) and very few people that have done two big movies back-to-back like that. I think that as these franchise films get more frequent, more people will do that. I just wanted to see if I could do it. As much as the material itself, I wanted to be the one that could handle that challenge. And it was extremely challenging. Still from the ruined streets sequence in the Capitol in “Mockingjay: Part 2”. Kirill: As you’ve worked with the same director and cinematographer on the last three movies of the franchise, did it help to maintain the visual continuity of the story? Philip: Gary Ross did the first one and chose not to do the second one. Francis Lawrence came in and did 2, 3 and 4. He is also a very gifted film maker and a friend. On 3 and 4 it was almost necessary that we had a working relationship because of the amount of decisions that needed to be made every day. There had to be a level of trust in knowing the pace and the decision-making process of the director and the cinematographer. It was so much to be done at the huge scale, and working with a new group of people and trying to reinvent the wheel could’ve stopped us cold. It was great fun to work with all those people. Kirill: What’s especially impressive for me was the cadence of doing four movies in as many years. That must’ve been a very compressed schedule that didn’t leave you a lot of time to prep for the next movie. Philip: I had the same amount of prep time for 3 & 4 as I had on 2. It was very difficult. And there are some sequences in Mockingjay part 1 where different parts would be shot on two different continents that would be four or five months apart. There was one scene in particular with the hospital getting bombed in Mockingjay 1. We start in one exterior location in Atlanta, we go to an interior location in Atlanta that was not in the same part of the city at all, then cut to Berlin that we shot months later, and then cut back to Atlanta. Those were really fun to stitch together, playing with time and space in a way that’s fascinating. Still of the Capitol’s costumes in “The Hunger Games”. Kirill: And you had the same between the first movie and the second, when the production has moved from Charlotte to Atlanta and had to recreate the sets that appeared in both movies. 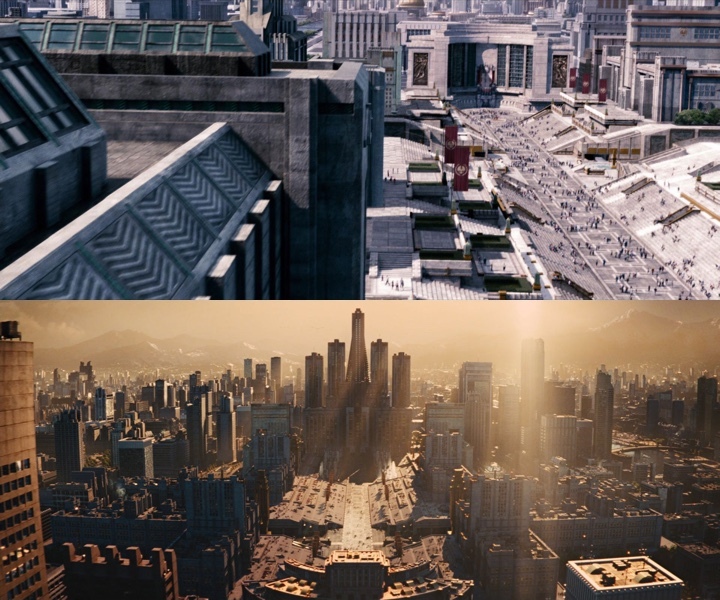 Philip: District 12 actually changed quite a bit, but we tried to minimize visually how much it was changing. Not only did I have to move to a different state, I had a different director at that point, so there were different ideas that came into play. 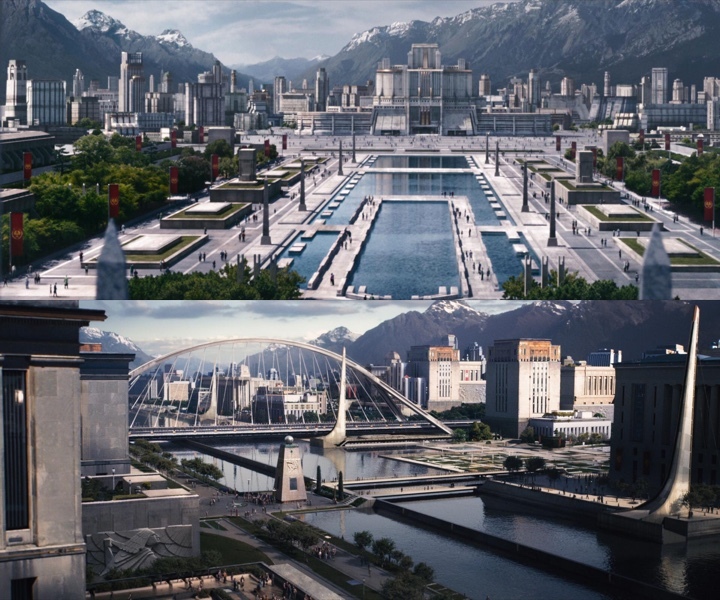 The Hall of Justice was the touchstone of what District 12 looked like, but the actual square, if you look at it again, looks completely different. The first movie was shot on a long lens and handheld. You had bits and pieces, but never got a lasting sense of the context as much as in the later films. I was able to have a little bit more leeway. It wasn’t my decision to move the production to Atlanta, and we had to figure out how to deal with it. You just hope you don’t get busted by the audience. Top: concept illustration for Hall of Justice in District 12 by Joanna Bush, courtesy of Philip Messina. 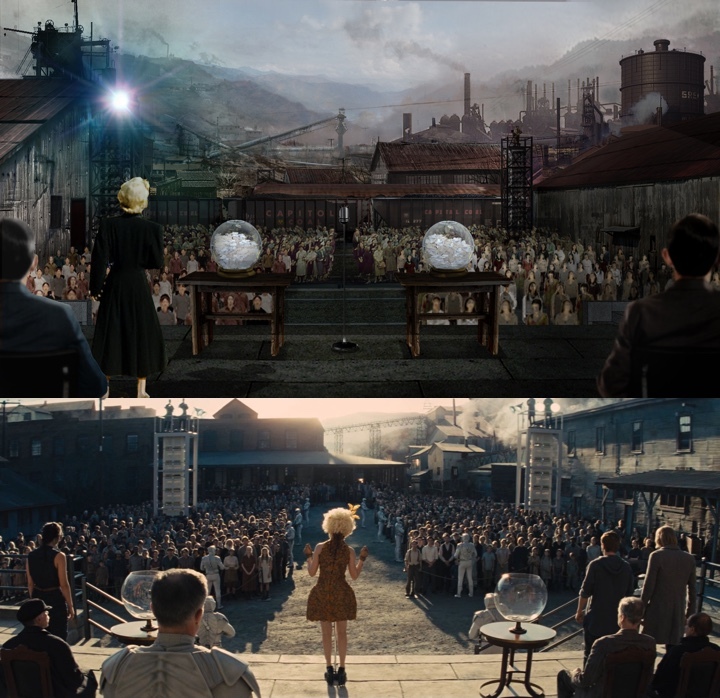 Middle and bottom – stills from “The Hunger Games” and “Catching Fire”. Kirill: As you take the established universe from the books and translate it visually to the big screen, how close to the books did you want to stay, and how much did you want to explore new takes on that universe? Philip: There are certain expectations that you need to fulfill because there are readers who are avid followers of the books and the films. So there are certain things that you know you can’t mess with. We kept copies of the books all around the office because we constantly looked up things, and it’s funny because we often found that the descriptions that we thought were so vivid in the books were actually – intentionally – vague. Suzanne Collins is such a good writer that she allowed the reader to fill in the blanks visually. You look at a lot of descriptions in there, and they are not as specific as you remember when you first read them. We were all sitting around and talking about a certain scene, and several of us would remember it very differently. And then we go to the book and she actually doesn’t even say anything, there’s not really a description of XYZ ! You just try to keep the spirit of it true. I feel like I’m a steward of both her vision and the director’s vision. I had great access to Suzanne throughout all those films. I could call her at any time, run things by her to get a sense of what she was thinking of, especially at the beginning. By the end it was not auto-pilot, but you would establish a template pretty clearly that you knew that you would operate within that, and where your bounds were. When we did the first one, the popularity was nowhere near what it was later on, so there wasn’t a lot of pressure. There was almost more pressure on the second movie, because the first one had been so successful. We started the second after the first one came out, and we were living with all that success and trying to make as good or better a film in “Catching Fire”. They were different enough with scale and tone that we were able to make a very good film as well. As far as internet chatter – I purposefully didn’t read a lot of that – it could be debilitating creatively and to be honest there’s no way to win with everyone. You try to be true. It’s not a committee decision. If I’ve satisfied – or hopefully at times exceeded – the expectations of the director, the novelist, and myself, I’ve done my job. And they have to trust me as I bring my vision to it, and if it all works together, that’s the magic that we talked about. That’s what you’re always aiming for. Top: concept illustration for Hall of Justice in District 12 by Joanna Bush, courtesy of Philip Messina. Bottom – still from “The Hunger Games” and “Catching Fire”. Kirill: As the storyline of the movies gets closer to the end, you’ve spent progressively more time in the Capitol. You have a lot of spaces that feel very totalitarian, like the big plaza for the parades – which transported me back to the Soviet days with those victory parades. Philip: I looked at a lot of Soviet architecture from the ’50s through the ’70s. We tried to stay away from Nazi Germany references. Ultimately the architecture of power and totalitarianism goes back to the Roman Empire. You build things to impress. You can find examples in religious architecture where you try to convey power and awe to people. The flip side of that is a brutalist environment, and it was great fun to play with scale and materials. The thing about the Capitol that I always harkened back to was that it was supposed to be horrific for people that didn’t live in it. It was actually supposed to be kind of cool if you live there, if you’re one of the few. That to me, if you’re a member of the elite, is impressive. And if you’re not, it’s very scary. Being able to take Katniss out of District 12 which was starved for any modern conveniences into the excesses of the Capitol was great fun. She was the audience, and we were able to treat them visually very similarly. I didn’t know that I was going to do all four movies. In the early days I would always say that I didn’t want to put whoever follows me into a corner creatively. You try to define things as much as they needed to be defined in earlier films. You try to establish a language, and the language we established in the first one stayed fairly true through all of them. It just got expressed more clearly as we really enter the Capitol, and the first movie was really barely in the Capitol. Stills of Avenue of Tributes from “The Hunger Games” and “Catching Fire”. The Avenue of the Tributes with the chariots was really designed for the first movie, and that stayed throughout all the films. There were little changes here and there in the background and buildings in the distance, but for the most part the model that was generated by the visual effects department was built by me in computer in a rudimentary way, with tons of references and details. And the model that we got back on the first movie was used as the basis for the rest of the films. That was satisfying. The one big challenge for “Mockingjay 2” was how to insert President Snow’s Palace into the Avenue of the Tributes. 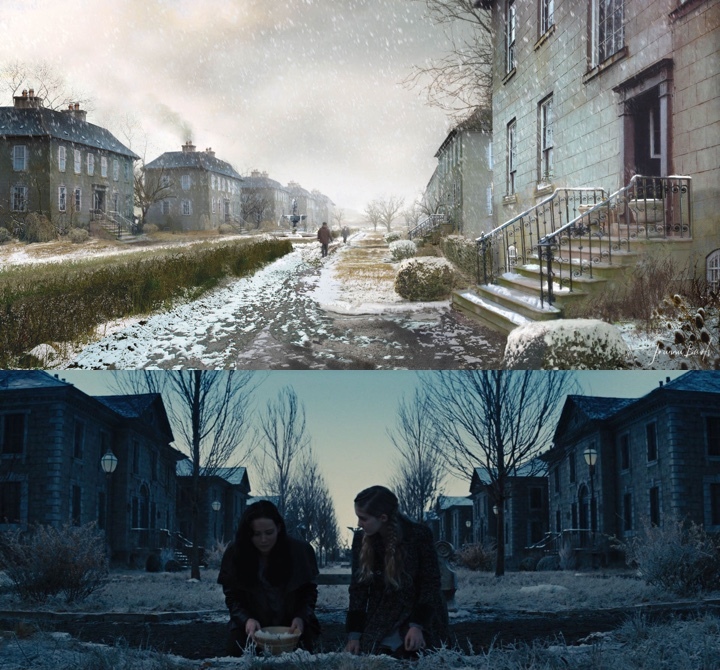 Francis and I looked at the 2 previous films with the chariot Parades and such and realized that there was one angle on the Avenue that was never clearly seen – and that became President Snow’s. Kirill: There’s such a variety of screens in our lives these days, and people watch movies on tablets, phones and the little terrible airliner screens. When you design scenes at such a grand scale, do you think about how it will be seen on these smaller screens? Philip: Of course. When we’re building a huge set and spending a lot of money, I always joke sarcastically about what it would look like on someone’s iPhone. You put so much loving detail into something, and then you see someone on a bus [laughs] watching it on their 2 inch screen! It’s the world that we live in – but I have to say the one word that I despise is ‘content’! 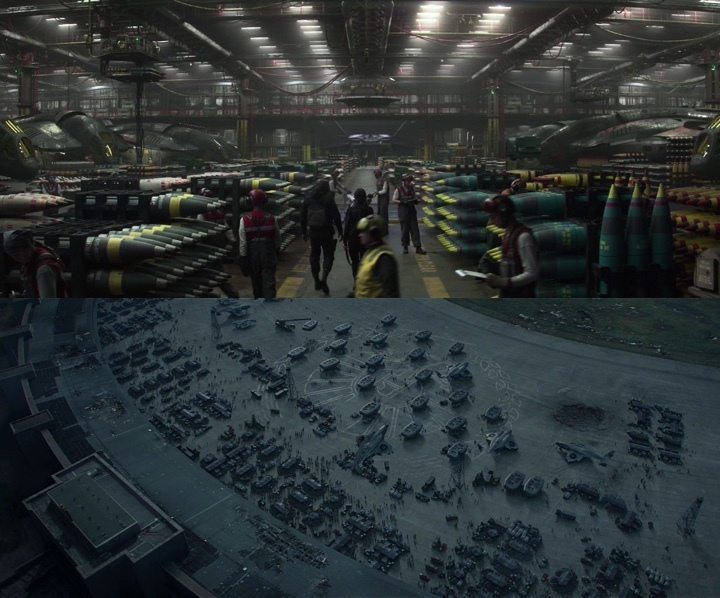 Stills of military installations in “Mockingjay”. Kirill: How did you approach researching the technology? You have the trains, and an advanced military system, and the games themselves, and on the other side you have such low-level low-tech societies in the remote districts. Philip: We talked about technology a lot. We tried not to make anything ‘magical’, and there were a few instance where we were forced to break those rules. The military was based on real technologies that are there, and a sort of forward thinking, but really trying to base it on real flying military machines. The armies were dressed and housed in things that looked military. I try to add realism to it, especially doing a fantasy movie. The more you can ground in reality, the better. In the beginning I was very aware of that we’re making a movie that is part set in what seems like the depression era and part set in science-fiction. It was very appealing because I couldn’t remember any other film that had done that before – where they were so intertwined. Sometimes it felt like I was working on a period movie, and sometimes I felt like I was working on science-fiction. That was the most fun, because you never get bored with either; you’re always bouncing back and forth. We would always talk about the world we live in now. There are people living in space, but there are also people in countries that are struggling to survive with the barest of means – people that quite possibly have never seen a screen. It actually does exist today in our world, unfortunately, so it’s really not that big of a leap when you think about it. Stills from Avenue of Tributes sequence in “Mockingjay: Part 2”. And here I’d like to thank Philip Messina for graciously agreeing to share his time with me to talk about his art and craft, and the wonderfully designed worlds of “The Hunger Games” franchise, and for sharing the concept illustrations for the interview. The complete 4-film collection is available for purchase in the variety of formats. His next movie “Free State of Jones” will play across the world starting in June 2016. If you’re interested in more stories on how films and TV shows are made, click here for more in-depth interviews.